I’ve spent the last few years rather flippantly stating, “Technical debt doesn’t exist.” What I was trying to say was, “I’m deeply uncomfortable with how our industry talks about this thing, I think it’s probably harmful, but I don’t know quite how to express what I mean. A year ago, I published WordPress in 2015. In retrospect, I’m very happy how the article turned out. The predictions were for the most part accurate, but materialised at varying speeds. You can check it out here. Looking back, 2015 was another strong year for WordPress and its ecosystem. I’ve been into science for as long as I can remember. As a kid, I star-gazed with my dad and hung out in the math class my mom taught at a local college. I told everyone that I was going to be a paleontologist, or an astronaut, or a physicist. While driving back home from a family wedding in Texas in October, we got a call from an agency we provide temporary pre-adoption fostering for that a baby boy had been born across the state from us. He would need fostering until a court date in a couple of weeks to terminate the parental rights of the non-involved biological father. Mention the word “selling” in the context of a blog, and some people will immediately have a bad reaction. It’s almost as if you said something sacrilegious. Why? Because we hate to be “sold.” People go online for information. Many times the information sought is needed to ultimately support a buying decision. The first beta of GlotPress as a WordPress plugin is now available! 🍾 Since the first meeting the current development team has achieved a lot. 81 Pull Requests were merged with more than 250 commits by 13 contributors! Now we need some help with testing what we have been working on. To usher in the new year, the jQuery team has been hard at work on 2 new releases: jQuery 1.12.0 and 2.2.0! These releases include lots of bug fixes and improvements to make your cross-browser development experience better. We anticipate this to be the last releases for the 1.x and 2.x branches before we release jQuery 3.0.
github-records-archiver – Backs up a GitHub organization’s repositories and all their associated information for archival purposes. If you waited to buy your ticket to WordCamp Europe 2016 in Vienna, you may be out of luck. The event sold out on December 31, 2015. All 1550 tickets, including 50 micro-sponsorship tickets are now gone. Sea cows took decades to emerge from a sea of troubles. Within a year, federal wildlife officials plan to reclassify the long-embattled Florida manatee from “endangered” to the less serious status of “threatened.” On Friday, the U.S. Fish and Wildlife Service plans to publish a proposed rule to reclassify the species. This week’s Post Status Draft podcast is hosted by Brian Krogsgard and Joe Hoyle. This week, they talk working in an agency and doing client work. Welcome to the Post Status Draft podcast, which you can find on iTunes, Stitcher, and via RSS for your favorite podcatcher. Help us help you …. we need to know where you are and where you want to go to help you prosper in 2016. So please take a few minutes and complete this survey! I am no stranger to contributing to open source. I have contributed in some way or another since early 2007, when I found a love for Linux and the Fedora Project. This post was contributed by guest author Jenny Beaumont. Jenny Beaumont is co-organizer of WordCamp Paris & WordCamp Europe, a frequent speaker at WordCamps in France and abroad, and a contributor to a number of blogs. After 17 years building things in and around the web, she is taking a year-long sabbatical to get a new outlook on life. Late in 2015, Arūnas Liuiza, a WordPress plugin developer, announced a new project called Measure Jetpack. Measure Jetpack is an independent, comprehensive series of benchmarks that will show how much impact Jetpack has on a site’s performance. Over the last few months, little information has been shared on the project’s status. Applications for the WordCamp US 2017 host city now open! 2017 is a year away but the planning for WordCamp US 2017 starts today! Before we can get too far in the planning process there are a few decisions that need to be made. At the very top of that list of details? by Hristo Product Development – Technical No Comments A new WordPress security update 4.4.1 was announced yesterday. The latest version fixes a cross-site scripting vulnerability that allows a site to be compromised as well as some minor issues. All WordPress sites at SiteGround with enabled autoupdate service have been updated to the new version 4.4.1 last night and are safe and sound. There’s a fun game I like to play in a group of trusted friends called “Controversial Opinion.” The rules are simple: Don’t talk about what was shared during Controversial Opinion after and you aren’t allowed to “argue” - only to ask questions about why that person feels that way. Custom Contact Forms has just passed one million downloads after nearly six years in the WordPress Plugin Directory. Last year Taylor Lovett released version 6.0, a completely rewritten version that made it one of the first plugins to incorporate the new WP REST API. Gravity Forms Signature Add-On v2.4 is now available via automatic update and the Add-On Downloads page. This is maintenance release that also updates the Signature Add-On to the latest version of the JS library utilized to capture signatures. Gravity Forms Stripe Add-On v2.0 is now available via automatic update and the Add-On Downloads page. This is a maintenance, feature and developer release. The Stripe Add-On now supports notification events to send notifications on payment/subscription events. Note: The Stripe Add-On is available to Gravity Forms Developer license customers. Image Credit: https://www.ostraining.com/landing/wordpress/ created the standard for Managed WordPress Hosting and offers Managed WordPress plans for Developers, Enterprise, and small business. Always secure, Always fast, our WordPress platform enables you to do more. Host Your Site Here Fresh content to your inbox. Subscribe below to receive a weekly email with the latest content from our blog. Easy Digital Downloads version 2.5 has been released! This update is a culmination of six months of development and the work of 14 different developers. We’re thrilled to bring this release to you today; let’s take a quick look at what is new. Between posts and comments, WordPress.com is an enormous hub of activity. The service recently published its 2015 year in review and the numbers are staggering. Last year, users published 660M posts that generated more than 655M comments. The review looks back at posts that went viral, books published by authors, and coverage of world events. High traffic sites that heavily depend on search can run into server resource issues and cause a sluggish experience for users. A good solution for this is to allow a third-party service to handle search for your site. We recently had a client that needed just that and ElasticSearch was a good fit. Entertainment David Peterson, creator of the Dothraki & Valyrian languages, stops by Reddit’s Books community for an AMA. David Peterson is famous for developing the fictional tongues like Dothraki and Valyrian for Games of Thrones; Castithan, Irathient, Indojisnen, and Kinuk’aaz for sci-fi series Defiance; and Verbis Diablo for Penny Dreadful. Last updated on by Editorial Staff WordPress 4.4 is coming with the much anticipated JSON REST API. It is great for plugin developers, but many site owners may not find it useful at all. In this article, we will show you how to easily disable JSON REST API in WordPress. This tee will challenge the stereotypes for you, so you can focus on talking about the awesome things you code without explaining everyone around that you are a programmer. Seriously. maskedlinguist: lizjamesbitch: patbaer: wellthatsjustgreat: babygrot: not-so-futureben: eatmoremacandcheese: “hi optus? 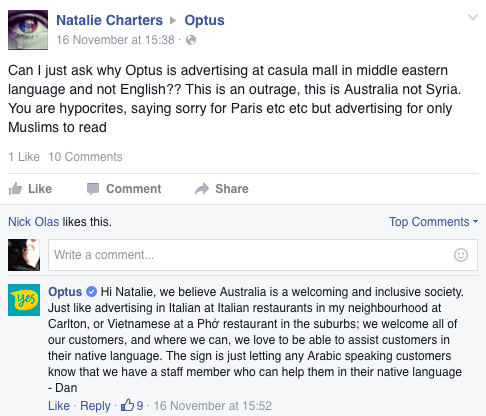 can i have dan’s number, i want to take them out for a beer and possibly marriage.” Dan from Optus is politely not having any of your racist crap today I want to buy Dan from Optus dinner Wow! New comic! So…it’s been a week. But it hasn’t really been a great week. WordPress 4.5 development is now in full swing with Mike Schroder at the helm, leading the kickoff meeting today. Schroder is joined by newly named deputies, Mel Choyce and Adam Silverstein, who will help manage the release. The 4.5 project schedule is now posted. LAS VEGAS – Forget the Segway you knew. The next generation of this personal mobility device is smarter, smaller and, yes, cuter, than ever before. Intel teased the bot at its CES keynote on Tuesday, but it wasn’t until the official unveiling on Wednesday that we finally get a good look at the black and white robot. Elvie is your most personal trainer. It’s a smart activity tracker that will transform your pelvic floor exercises. Even though hooks in WordPress are amazing and everyone uses them knowingly or unknowingly, I get the impression that some advanced users and especially front-end developers still seem to avoid them. If you feel like you’ve been holding back on hooks, too, then this article will get you started. A few weeks ago, I put out a call for volunteers for deputies for WordPress 4.5. Today, I’m excited to announce two deputies: WordPress Committer Mel Choyce (@melchoyce) will be a Design Deputy, with a focus on maintaining UI/UX consistency and handling design decisions throughout the release. Or do you offer a WordPress third-party service? Would you like a detailed review of your theme, plugin or service on my blog? Would you like it shared with thousands of WordPress users-and coming from a trusted WordPress source? I have been reviewing WordPress themes, plugins and services for years. This post is part of an ongoing Good Client Guide series, which serves to demystify the web development process and empower consumers of web design (known to many in the industry as The Client™) to be an informed and effective partner in the process. The process of getting a website developed for your business is exciting…. Briar is a new minimalist theme that landed in the WordPress directory last month. It’s the type of bold, non-flashy theme that puts the spotlight on content and images without trying to stuff widgets into the reading experience. Briar was created by the folks at Slicejack, a Croatia-based development company and a brand new WordPress.org theme author.